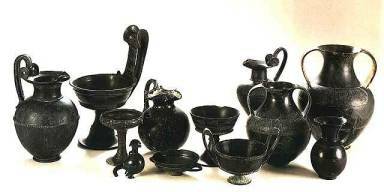 Etruscan culture developed in northern and central Italy after ca 800 BC without a serious break out of the preceding Villanovan culture. The Villanovan culture, the earliest Iron Age culture of central and northern Italy, gave way in the 7th century to an increasingly orientalizing culture that was influenced by Greek traders and Greek neighbors in Magna Graecia, the Hellenic civilization of southern Italy. The Etruscan civilization flourished in Etruria and the Po valley in the northern part of what is now Italy, prior to the arrival of Gauls in the Po valley and the formation of the Roman Republic. Etruscan history is rooted in layers of mystery. Throughout time art historians and archaeologists have tried to milk truths of Etruscan culture from sources plagued by holes and ambiguities. 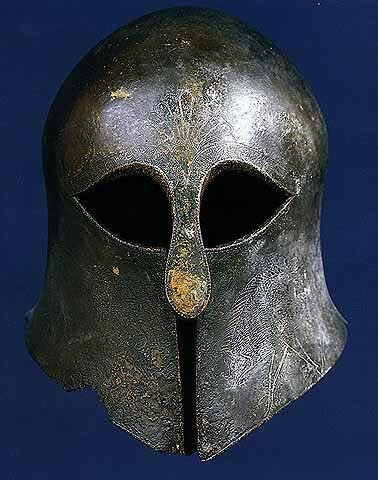 Much of what we have come to know of Etruscan culture has stemmed from the writings of other cultures, mainly that of the Greeks and the Romans, and directly from archaeological evidence gathered from the objects they left behind. 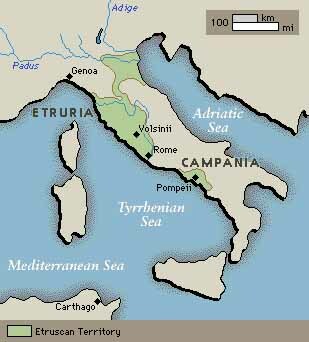 The land of Etruria occupied what is now Tuscany in central Italy. 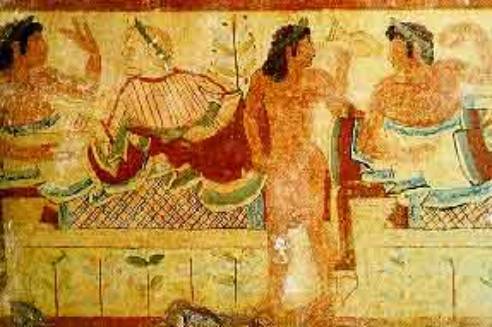 The origin of the Etruscans is still an object of debate and a mystery that has sparked investigation by many great writers and scholars. In the first century B.C., a Greek named Dionysius of Halicarnassus studied the early cultures of Italy in Rome; he came to believe that the Etruscans originated from the Pelasgians who settled with natives of the area, only to be taken over by the Tyrrhenians. In the beginning of the first century AD, Livy and Virgil believed that the migration of the Etruscans to central Italy was resultant of the fall of Troy and flight of Aeneas. Then in fifth century Greece, Herodotus insisted that the Etruscans traveled from Lydia to Italy due to famine; their leader at that time was Tyrrhenos, from whom they adopted the name the Tyrrhenians. Now, modern thinkers follow the postulations of Herodotus or Dionysius. And, new research shows that the Etruscans were descendants of people who thrived in the ninth to eighth centuries BC known as the Villanovans. 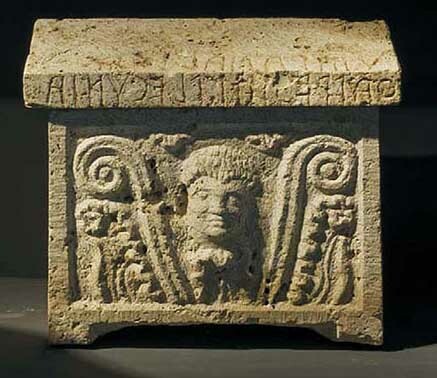 Etruscan cities began to arise in the seventh century BC where Villanovan villages had been. The first Etruscan pieces to be discovered were two bronzes found in 1553 and 1556 during the Renaissance. Etruscan excavations began in the eighteenth century, and in the nineteenth century major archaeological evidence was found at Tarquinia, Cerveteri, and Vulci. At that point, Estrucan culture and the mysteries surrounding it gained notice by museums which started to collect the objects unearthed in the digs. In the twentieth century archaeologists began to use sonar photographic sound, a means that determines whether or not excavation would be lucrative before entering a burial chamber; this and other technology has allowed for more than 6,000 grave sites to be examined. Among all that has been discovered through these various times and means of investigation and excavation, there are no Etruscan literary works or historical accounts. There are, however, many writing samples carved on tombs. The Etruscan writing system is unique in that its letters come from the Greek alphabet, yet its grammatical structure is unlike any other European language. The epitaphs usually tell of the person's name, class, occupation, and also sometimes delineate whom he or she was related to, thus enabling experts to elicit certain genealogies. Other conclusive information about the Etruscans comes from writers of other times. Religion was at the heart of Etruscan culture. The Romans themselves depended on some Etruscan books of divination, that is, the practice of foretelling the future, and determining the will of the gods through signs. The Etruscans followed three books of divination concerned with reading entrails of animals, lightning, and the flight patterns of birds respectively. The Etruscans myths were heavily influenced by the Greeks, mainly the fact that their gods possessed human attributes and dispositions. The Etruscans often combined Greek influences with stories of their own. There is also mythology purely Etruscan, in accordance with which many cults gathered in dedication to their gods. In Etruscan religion, the realms occupied by humans and by the gods are very specific, and their practices followed very exact procedures to avoid ill will of the gods. On a political and economical level, the Etruscans are known as great seafarers, and wealthy miners of iron, copper, tin, lead, and silver. These two sources of wealth lead them to the zenith of their cultural and political power in the sixth century. Also around this time, Latin cities were erected and influenced greatly by the flourishing Etruscan culture surrounding them. However, Latin cultures soon united with some of the Greek settlements, and in 504 BC, the Etruscans were driven from Latium when their army was defeated. After this, Tarquinius Superbus the Etruscan king of Rome fell, and the Roman republic formed; from this point on, Roman history is rooted in Latin culture instead of that of the Etruscans. The decline in Etruscan wealth manifested itself in their tombs, ever growing in modesty, the end of public building and importing of Attic pottery, and a dramatic decrease in political participation. In 386 B.C., the Gauls took over Rome and the Po valley, causing the Etruscans to lose their trading routes across the Alps. Toward the end of fourth century B.C., the Etruscans rebelled against the Roman republic , but were defeated despite help from allies of Gauls, Samnites, and Lucancians. In 282 B.C. they accepted a peace treaty after suffering another defeat. Within a few years, all Etruscan cities were taken over by Rome, and the Etruscans thus vanished from the political realms of the world. The fall of the Etruscan state can be attributed to a variety of factors, the most influential being its disunity. The Etruscan state government was essentially a theocracy. 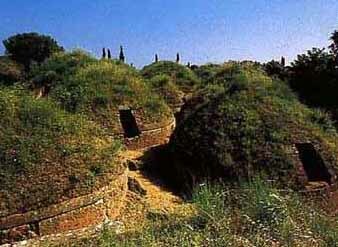 The Etruscans met annually at the shrine of Voltumna to discuss military and political affairs. Apart from this, the Etruscans could be considered, as many ancient sources describe them, "duodecim populi Eturiae" or "the twelve peoples of Eturia". Although the divisions between the states were not as extreme as those found in ancient Greece, individual states were under no obligation to provide aid to one another, and frequently found it difficult to unify against one threat. For this reason, the Romans attacked and annexed individual cities between 510 and 29 BC. This disunity is further illustrated by the fact that Rome created treaties individually with the Etruscan states, rather than the whole. With the fall of Veii to the Romans, a key southern defense was destroyed, leaving the Etruscans pressed in on from all sides by several different forces, and ripe for conquest. The Etruscans are generally believed to have spoken a non-Indo-European language. Herodotus (c. 400 BC) records the legend that they came from Lydia (modern western Turkey). Contrarily, Dionysius of Halicarnassus (c. 100 BC) pronounced that the Etruscans were indigenous to Italy, calling themselves Rasenna and being part of an ancient nation "which does not resemble any other people in their language or in their way of life, or customs." Knowledge of the Etruscan language only began with the discovery of the bilingual Phoenician-Etruscan Pyrgi Tablets found at the port of Caere in 1964, and this knowledge is still incomplete. Some researchers have proposed that the non-Greek inscriptions found on the island of Lemnos, appearing to be related to the Etruscan language and dated to the sixth century BC, support Herodotus' hypothesis. However, recent research, referencing burial rituals, shows that there was no break in practices from the earlier settlements of the Villanovan culture to the Etruscans, indicating that they were likely indigenous after all. The disciplina etrusca seems to have comprised three categories of books of fate. The first was that of the libri haruspicini, which dealt with divination from the livers of sacrificed animals; the second, the libri fulgurates, on the interpretation of thunder and lightning; the third, the libri rituales, which covered a variety of matters. They contained, as Festus says, "prescriptions concerning the founding of cities, the consecration of altars and temples, the inviolability of ramparts, the laws relating to city gates, the division into tribes, curiae and centuriae, the constitution and organization of armies, and all other things of this nature concerning war and peace. Among the libri rituales were also three further categories: the libri fatales, on the division of time and the life-span of individuals and peoples; the libri Acherontici, on the world beyond the grave and the rituals for salvation; and finally, the ostentaria, which gave rules for interpreting signs and portents and laid down the propitiatory and expiatory acts needed to obviate disaster and to placate the gods. So complex and all-embracing a doctrine naturally required long and laborious study. For this, the Etruscans had special training institutes, among which that at Tarquinii early enjoyed the highest repute. These institutes were much more than priests' seminaries in the modern sense. To judge by their range of studies they were a kind of university with several faculties. For their curricula included not only religious laws and theology, but also the encyclopaedic knowledge required by the priests, which ranged from astronomy and meteorology through zoology, ornithology, and botany to geology and hydraulics. The last subject was the specialty of the aquivices who advised the city-states on all their hydraulic engineering projects. They were expert diviners who knew how to find subterranean water and how to bore wells, how to dig water channels, supply drinking water in the towns, and install irrigation and drainage systems in the fields. In addition they could create artificial reservoirs and they collaborated with other priests who specialized in constructing subterranean corridors and tunneling mountains. In Etruria, as in the ancient East, theological and secular knowledge were not separated. Whatever man set himself to do on earth must be in consonance with the cosmos. Thus all the efforts of the priests were directed upon the heavens when it was necessary to discover the will of the gods in accordance with the sacred doctrine. The orientation and division of space were of crucial importance as much in divination from an animal's liver as in laying the foundation of a temple, in interpreting a shooting star as in surveying land and marking out a garden and field. Etruscan Statues show some of the best examples of the energy and excitement that characterize Etruscan art. Bright paint, swelling contours, animated faces, and gesticulations distinguish the statues. The statue at left is Apulu (Apollo) from the roof of the Portonaccio Temple in Veii, Italy. It is believed to have been made around 510-500 B.C. and is 5 feet 11 inches tall. Notice the rippling folds of his garment and the way the statue leans into its forward movement. In comparison to the statue at right which is a Greek statue of Apollo made in 460 B. C. The Greek statue is much more calm looking, as if he is going to be in motion rather than in the process of movement. 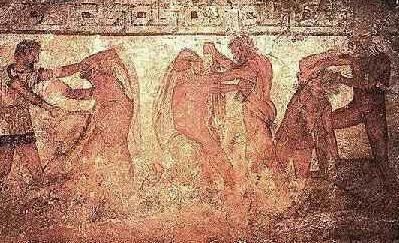 Mythological figures are extremely uncommon in murals found in tombs. The most common theme is of banqueting couples with servants serving the meal and musicians playing. The people in the murals all are making exaggerated gestures. The next most common theme is that of Etruscans enjoying nature. One mural depicts youthful hunters aiming slingshots at colorful birds. Etruscan Pottery followed closely the style of Greek pottery , but the people were more lively much like the statues. One type of pottery that seems to be very unique to Etruscans is bucchero. It became common in the between the seventh and fifth century B.C. and is black and shiny from polishing. The black color was made by firing in an atmosphere charged with carbon monoxide instead of oxygen. Many people believe that bucchero was made to look like silver pots but were for those that couldn't afford the price of silver. However, bucchero is believed to have been almost as expensive as silver. The Etruscans were the masters of bronze sculpture and were praised by the Greeks and Romans for their skill. Sadly we have only a few examples of the Etruscans skill with bronze because after Rome occupied the area many of the bronze statues were sent to Rome to be melted down and made into bronze coins. The statues like much of Etruscan art are characterized by their lively features. One vivid example of the Etruscans artistry is the Chimera of Arezzo shown at right. 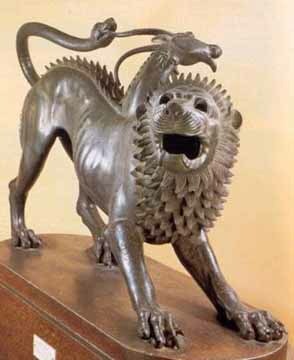 The Chimera is a Greek monster with a lion's head and body and a serpent's tail. A second head of a goat grows out of the left side of the body. This statue is made in the action of attack, the skin is stretched tightly over the muscles and it looks up into the face of an unseen adversary. The Etruscans attributed great importance to the cult of the dead, because it was also a means of asserting the prestige and power of a family. We can distinguish different periods in this cult and its development is also reflected in the typologies of the necropolises. In the earliest times, the Etruscans were closely attached to the conception of the continuation of a vital activity by the deceased after death. The tomb was thus built like a house and given furnishings and decorations, both real and reproduced in miniature. Sometimes the walls were frescoed with scenes from daily life or the most important, serene and pleasant moments in the deceased's life. In the same way, cornices, beams, ceilings and frontons, intended to reconstruct the home environment, were painted or sculpted in the rock. The most ancient examples of monumental tombs were built on the model of the dwelling then in use: a hut with a round or oblong floor-plan. These circular tombs were built using large blocks of stone and covered with a false dome obtained from the progressive inward projection of the rows of blocks until a last slab closed the roof. Access to the sepulchral chamber was through a short corridor where offerings of food or furnishings were often placed. When this type of tomb was abandoned, tombs excavated underground, first of all with a single room and then with several chambers, were used. The tombs excavated completely underground, generally in hillsides, are defined as "hypogeal" tombs, while those excavated in flat land and covered by soil and gravel are known as "tumuli". This new type was characterized by a central chamber accessible from a long passage beyond which there were other chambers. The floor-plan could be very complex with a passageway, lateral chambers and a central hall with columns and benches. At times, the tumuli assumed monumental dimensions, with a diameter of over 90 feet and they contained various tombs of members of the same family. Examples of the first period can be seen in Cerveteri and can be linked to the evolution of the dwelling typologies contemporary with the necropolis (second half of the 7th century BC) when houses were divided into two or three rooms flanked and preceded by a sort of vestibule or built around a central courtyard. From the mid 6th century BC and throughout the 5th century BC, there was another change in the plans of the necropolises. The new tombs were called "cubes" and were built side by side in rows, forming real cities of the dead with streets and squares. Inside the tombs there were only two chambers, and outside there were lateral steps leading to the top of the cube where there were altars for worship. This change reflects a profound modification in the social structure, with the establishment of a non-aristocratic class encouraging less ostentatious houses. Furthermore, due to the influence of the Greek world, the basic conceptions regarding the destiny of the dead had also undergone a change. The primitive faith in the "survival" of the deceased in their tombs had been replaced by the idea of a "kingdom of the dead", imagined along the model of the Greek Avernus. Because of the materials the Etruscans used to build their temples we only have the foundations, and Vitruvius' account of the temples designs. The representative Etruscan temple resembles the Greek gable-roofed temple, but was made of wood and sun-dried brick with terracotta decoration instead of stone. The Etruscan temple had columns only on one side, which created a porch-like entrance, which set this side off as the temple's front, which was unlike the Greek temple. The Etruscan temple was mainly used to house statues of Etruscan God's. Statues made of terracotta were also placed on the peak of the Etruscan temple roof. 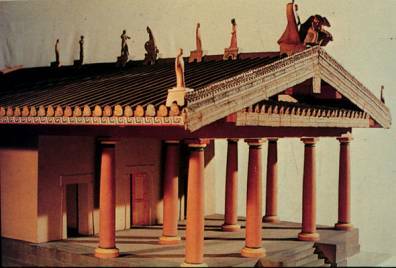 The picture below is a model of what we believe an Etruscan Temple would have looked like. The Etruscans believed in predestination. Although a postponement is sometimes possible by means of prayer and sacrifice, the end is certain. According to the libri fatales as described by Censorinus, Man had allocated to him a cycle of seven times twelve years. Anyone who lived beyond these years, lost the ability to understand the signs of the Gods. The Etruscans also believed the existence of their people was also limited by a timescale fixed by the gods. According to the doctrine, ten saecula were allotted to the Etruscan name. This proved very accurate, and it is often said that the Etruscan people predicted their own downfall. The basis of Etruscan religion was the fundamental idea that the destiny of man was completely determined by the vagaries of the many deities worshipped by the Etruscans. Every natural phenomenon, such as lightning, the structure of the internal organs of sacrificial animals, or the flight patterns of birds, was therefore an expression of the divine will, and contained a message which could be interpreted by trained priests such as Augurs. Emerging from this basic concept the Rasenna scrupulously followed a complex code of rituals known by the Romans as the "disciplina etrusca". Even up to the fall of the Roman Empire, the Etruscans were regarded by their contemporaries with great respect for their religion and superstitions. It may have been the fact that Etruscan religious beliefs and practices were so deep-rooted among the Romans that led to the complete destruction of all Etruscan literature as a result of the advent of Christianity. Arnobius, one of the first Christian apologists, living around 300CE, wrote ,"Etruria is the originator and mother of all superstition". When the Gothic army under Alaric was approaching Rome, the offer made to Pope Innocent I by Etruscan Haruspices was seriously considered by the senate, but finally rejected. The obvious Eastern Greek influence in Etruscan religion and art from the emergence of the civilisation in the 8th Century CE, can be interpreted either as evidence of the Etruscan origins in Lydia, or as the influence of subsequent Greek settlement in the prosperous region of Etruria. However it is interpreted, the Etruscan religion was fundamentally unique to the region. The Etruscan Religion was, supposedly akin to Christianity and Judaism, a revealed religion. An account of the revelation is given by Cicero. One day a farmer from Tarquinia, while he was busy working in the fields, ploughing the white land with long and straight furrows, drove his harrow into the ground and saw the body of a young boy coming to the surface. According to the Etruscan tradition the young boy was Tagetes, the wise and worshipped prophet-child whose words were listened to by a crowd of people whose number apparently rose hugely with the passing of time. Tagetes taught the Etruscans the difficult discipline of haruspicy, the art of divining the future by observing the entrails of sacrificed animals, namely the liver. The haruspex was a priest highly thought of by this people; he was so important in divining the future that his "profession" outlived the Etruscan civilization itself for centuries, after the latter was absorbed in the Roman civilization. The Tagetic Books were part of the sacred tradition of the Etruscan people which is famous all over the world for its deep religion: they contained the rules and the indications for better understanding the will and the signs of the divinity, and consequently for behaving through actions such as sacrifices, libations and different rites. The Etruscan religious literature and particularly those books were greatly successful in the ancient Roman world; they were appreciated especially in the II and III centuries A.D., when similar esoteric doctrines became widespread in opposition to the dawning Christianity. Other famous volumes are the Vegonic Books, containing the indications dictated by Vegoia, the nymph who dictated the rules to establish the boundaries of fields, real estates and the territory of cities. A short passage was handed down by Tarquitius, a I-century-b.C. writer who had had the possibility of reading some passages of those books in Apollo's temple in Rome, where a copy of them was kept with other "pagan" volumes that were then apparently burnt by Stilicho: this passage relates the famous prophecy of the nine-centuries duration of the Etruscan people and nation. And this is, in fact, the duration of the period of political independence of the Etruscans, if we consider the time from the Villanovan phase to the beginning of the I century b.C., that is when the Etruscans obtained the civitas, the Roman citizenship. The relationship the Etruscans had with their divinities was quite different from the one of other peoples in the ancient world: while the Greeks believed the gods lived in their own world, often careless of the human world and accustomed to the same passions and weaknesses of humanity, the Romans had a relationship with gods merely based on juridical rules. The Romans had a strict series of rules that often consisted of a sort of a mere exchange: if I receive a particular grace I will dedicate this ex-voto to the divinity: this is what some of them seemed to say, similarly to what happens today in the religions of the South and Centre of Italy where it often borders on paganism and fetishism. 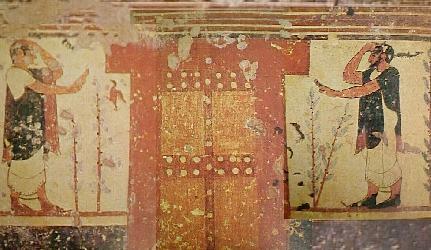 On the contrary, the Etruscans had a relationship with the gods based on submission: the divinities lived in the sky or under the ground and it was necessary to understand their will by observing the ostenta, the signs that, through the haruspex and the augur priests, indicated the behavior one had to have. This sense of deep religiousness, it may be said almost of inferiority towards anything concerning the divine, suggests a feeling of oppression. Every single action of a human being was "controlled" by that particular divinity, similarly to the popular religiousness of the other peoples in ancient Italy, namely the Latins. Therefore all religious practices, rites, sacrifices, the division of space into "dwellings", each of them inhabited by a particular divinity, were so important in the life and culture of this people that it was admired by the other peoples for its dedication and devotion; on the other side, Christian writers came to deprecating the Etruscan religion, like Arnobius (IV century A.D.) who apparently accused Etruria itself of being the "land of all superstitions". Though very little of the Etruscans religious literature has survived, we know it contained not only the indications of the divinatory practices but also the rules and the practices concerning the civil, political and military life of this people. The divinities of the Etruscan pantheon were numerous; some of them, entirely new, were introduced during the profound Hellenization of culture, others were identified with analogue divinities, others preceded the coming of the Greek gods. In order to know their names and position in the universe, a bronze model of sheep liver can be helpful: it is the famous "Piacenza liver" (II-I century b.C.) divided into specific cells with the inscription of the names of the divinities of the sky such as Tinia (Jupiter) and Uni (Juno), of the sun such as Nethuns (Neptune), of the earth such as Fufluns and Selvans, and of the hell such as Cel, Culsu, Vetis, Cilens, Vanth, Charun (Charon). We can also remember, among the divinities borrowed from the Hellenic culture, Menerva (Minerva), Aplu (Apollo), Artumes (Artemis), Maris (Mars), Turms (Mercury), Hercle (Hercules). An important divinity was Voltumna, worshipped in a shrine at Orvieto, the ancient Volsinii destroyed by the Romans in 264 BC. it became the federal sanctuary of the Etruscans and, consequently, its god too became the main divinity. Some people suggested he could be identified with Vortumnus, the god worshipped in Rome on the Aventine after the destruction of Volsinii. Maybe the name does not refer to a particular god, but it could be a designation of Tinia, that is Jupiter, the main divinity. Among the main temples whose ruins can be seen in the province of Viterbo, there is the important temple of Artemis at Tarquinia, in the area of the ancient town - a relief model can be seen in the Archaeological Museum of the town itself where one can also admire the very famous winged horses that are part of the image of our home page. we can remember the big volcanic-stone cylindrical altar of Grotta Porcina at Vetralla and also all the terraces of the cube- and semi-cube-tombs of the rupestrian necropolis, where Etruscan priests performed the rites and ceremonies in honor to the divinities of the next world and in memory of the dead. In order to know the procedures of some of these rites, epigraphic sources can be helpful, and particularly two extraordinarily valuable documents: the Capua tile, a big terra-cotta tile with the inscription of the rules for the offering to the gods, and the Zagreb mummy, a book made of inscribed linen rolls reused in Egypt in the I century b.C. to wrap up the body of a dead person. This mummy was taken to the West by a XIX-century merchant and precisely in the Croatian town towards the half of last century, but its importance was recognized only at the end of that century. The book arrived in Egypt with a group of Etruscans (maybe coming from Romanized northern Etruria) who went to Africa (a Roman colonial territory too) looking for a better life. The linen bands show the black-ink inscription of a sort of religious feast-days calendar, offers and prayers that had to be dedicated time after time to the divinity of a particular day. Not all the text has been understood. The Etruscan people, therefore, has amazed its contemporaries with their meticulous, respectful and accurate religious rites and they continue to amaze us today for the complexity of their sacred world and maybe for the strong spirituality emanated by the ancient sepulchres, the places of living and the sacred grounds of our forefathers. Aivas, Eivas, Evas Ajax aivas tlamunus, aivas vilates - Terror "
Aplu Apollo Weather God:Thunder and lightning. Wears laurel Wreath, holds staff & laurel twig. Artumes/Artimi Artemis Goddess of night and death, Growth in nature. Cautha, Cath � Sun god. Often shown rising from the ocean. Charontes � Etruscan demons of death. Name suggests a connection with Charun/Charon. Cul, Culsu � Culsu: The Etruscan demoness: guards the underworld. Torch & scissors. Feronia � Etruscan Goddess who protects freedmen, associated with woodlands, fire & fertility. Fufluns, (Pacha?) Bacchus? God of wine, Rebirth, Spring. Wild Nature. Fertility.Son of the earth-goddess Semia. Herc/Horacle/Hercle Heracles Strength & Water ? Karun/Charun Charon Demon of death; Blue Demon? With Red hair and snake, feathered wings and an axe or hammer. Or human with red hair & beard. The Lasa: Alpan, Evan, Racuneta & Vecu � Female deities, guardians of graves. Attributes: mirrors & wreaths. Maris Mars Agriculture. Fertility. Savior God. Nortia Fortuna Goddess of fate and fortune. At the beginning of the New Year a nail was driven into a wall in her sanctuary as a fertility rite. Persipnei/Ferspnai Persephone/ Prosperpine Queen of the Underworld. Semla Semele Mother of Atuns. In common Mother and child motif. Silenus Silenus The Satyr. *Wild Nature"
Tuchulcha � Grotesque demon. Horse's ears, a vulture's beak and snakes in his hands. Tinia Tins Jupiter Supreme God. Sky god.With Uni, & Menrva forms a triad of gods. Attributes: Lightning bolts, spear and a scepter. Tluscva (Tellus and Tellumo) � Tellus and Tellumo, Earth mother and father. Turan Venus Goddess of love, health & fertility, Goddess of the city Vulci. Usually portrayed as a young woman with wings on her back. Attributes: Pigeon and black swan. Accompanied by the Lasas. Wife of Maris. Turns Aitas � "Hermes of Hades" Leader of the dead. Uni Juno The supreme goddess. She is the goddess of the cosmos, City goddess of Perugia. Together with her husband Tinia and the goddess Menrva she forms a triad. Mother of Hercle (Hercules). Veive � God of revenge: Youth with laurel wreath & arrows in hand. A goat stands next to him. Vanth � female demon of death. Lives in the underworld. With the eyes on her wings she sees all and is omni-present. Herald of death and can assist a sick person on his deathbed. Attributes:snake,torch & key. Veltha Voltumna, Vertumnus Original God of the Etruscans, Patron of the Etruscan League Centred on the Fanum Voltumnae in Volsinii.God of Change,Seasons. Italian archaeologists have discovered lotion that is over 2000 years old, left almost intact in the cosmetic case of an aristocratic Etruscan woman. The discovery, which occurred four years ago in a necropolis near the Tuscan town of Chiusi, has just been made public, following chemical analysis which identified the original compounds of the ancient ointment. The team reports their findings in the July issue of the Journal of Archaeological Science. Dating to the second half of the second century B.C., the intact tomb was found sealed by a large terracotta tile. The site featured a red-purple painted inscription with the name of the deceased: Thana Presnti Plecunia Umranalisa. "From the formula of the name, we learn that Thana Plecunia was the daughter of a lady named Umranei, a member of one of the most important aristocratic families of Chiusi," the researchers wrote. Indeed, the wide rectangular niche tomb certainly represents the noble origins of the deceased. The ashes of Thana rested in a small travertine urn, decorated with luxuriant foliate elements and the head of a female goddess, most likely the Etruscan Earth goddess Cel Ati. One of anthropology's most enduring mysteries - the origins of the ancient Etruscan civilisation - may finally have been solved, with a study of cattle. This culturally distinct and technologically advanced civilisation inhabited central Italy from about the 8th century BC, until it was assimilated into Roman culture around the end of the 4th century BC. The origins of the Etruscans, with their own non-Indo-European language, have been debated by archaeologists, geneticists and linguists for centuries. Writing in the 5th century BC, the Ancient Greek historian Herodotus claimed that the Etruscans had arrived in Italy from Lydia, now called Anatolia in modern-day Turkey. To try and discover more about the Etruscans' movements, Marco Pellecchia at the Catholic University of the Sacred Heart in Piacenza, Italy, and colleagues have analysed mitochondrial DNA in modern herds of Bos Taurus cattle in the north, south and central regions of Italy. This genetic material is passed down the female line from mother to offspring. Pellecchia notes that no archaeological or genetic traces of Etruscan culture have been found elsewhere between Turkey and Italy. This, combined with the Etruscans' famed nautical prowess leads Pellecchia to conclude that the Etruscans and their cattle arrived in Italy by sea, and not by land. Mark Thomas, a human geneticist at University College London in the UK, says that European cattle tend to be genetically very similar, so the study's conclusion is plausible.